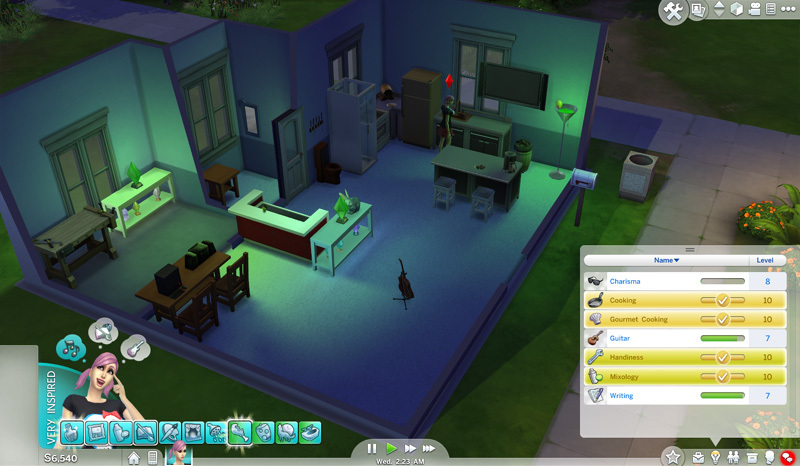 My guide to a Creativity sim. Would be a Creative Renaissance Sim, but the Renaissance Sim Aspiration is bugged. This goes through four careers, 12 skills, 8 aspirations and 20 achievements. I started with a blank lot. I like the lot next to the entrance to Sylvan Glade. Make a one room house. Don’t buy furniture yet, slowly fill them in as you need them/when you get whims. Buy the cheapest furniture except for the most expensive shower, second most expensive bed and second cheapest toilet. Write books until you get Writer’s Block. Don’t publish your books. Once you have Writer’s Block, buy the shower and start getting Inspired. Place inspiring decor if you have them unlocked (enable the aura). ♥ Clear Beat Writer’s Block and Write 2 Books. ♥ Finish your current book. We will now start to switch aspirations with each activity. It’s a bit tedious but well worth it. We’ll start with Culinary for our first career. Get a job. Switch to the Master Chef aspiration and start cooking. Wash three meals for your promotion requirement. Buy a television and Watch Culinary Training Videos when you eat. ♥ Work – Get an inspiring shower before going to work. Switch to Work Hard. ♥ Complete Master Chef 1. ♥ Complete Master Mixologist 1. ♥ Complete Musical Genius 1. You can Listen to Music while cooking. Aspiration doesn’t have to be active. Repair broken objects to raise your Handiness. Upgrade when you can. When you place your career rewards, remember to Enable Emotional Aura. We’ll now make some friends. Switch to Friend of the World. Set up a Focus room. Upgrade something. Psych Self Up (Mirror). ♥ Complete Introduce Self to 10 Sims (at least 2 Neighbours). 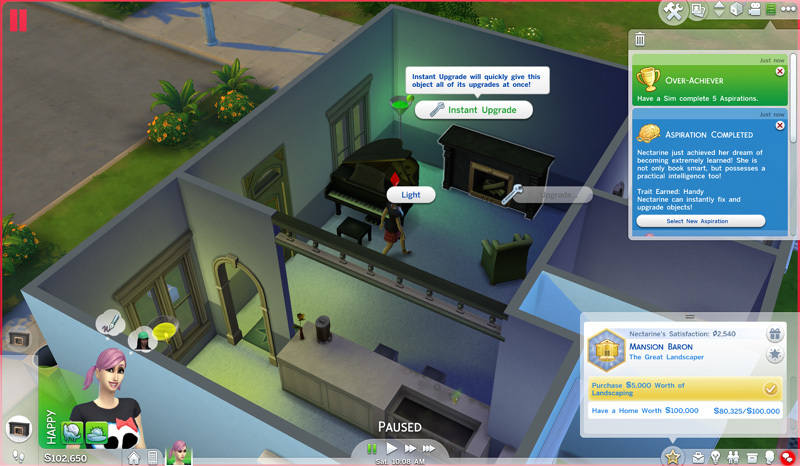 ♥ Complete Musical Genius 2 – For Earn §100 Playing for Tips, there isn’t an interaction for this; Go to a Community Lot and Jam. Take a shower first and then invite all your new friends-to-be so you have an audience. ♥ 4,000 Satisfaction – Never Weary; sell your bed. Make a room with a toilet for your guests. ♥ Select Master Chef, cook a group meal. ♥ Select Master Mixologist, mix drinks. ♥ Select Master Chef when you hit silver. ♥ Select Party Animal to get the count. To select Make Drinks for Everyone, you need to be in a group conversation, so chat with someone already chatting, then make drinks. Once you start mixing, cancel the conversation so you mix faster. You will be confident after your party, so make sure you are talking with someone before they all leave (so you can keep talking to them), since confidence boosts Charisma. ♥ Fun – Read the Mixology skill book. When you hit the career folk, choose the Mixologist branch. You need this to complete the Master Mixologist Aspiration. ♥ Complete Friend of the World 4 – Have a Friendly Relationship with 25 Sims means you need to have a positive relationship, you do not have to be friends. Just introduce yourself till you reach it. At this point you can ignore whims. I was still at career level 8. With Cooking, Gourmet Cooking and Mixology maxed, Charisma 8 and Handiness 7. While waiting for the last two levels, I worked on Handiness by upgrading my stuff and building new furniture. After completing Handiness, I started raising Writing (Don’t Publish any books yet). For Fun, I bought a Telescope to raise Logic and get some collectibles. Once you reach the final promotion, get both rewards before switching to the Writer career. ♥ Fun – Daily Task, Read Books. Read your own books before you publish them. Once your Daily Task is complete, continue raising Logic. ♥ Switch to Nerd Brain before reading. Either branch will do. The Author branch requires you to submit two books to Literary Digests (which means a minimum of one week if you haven’t submitted one already); the Journalist branch requires Charisma 5, which you should already have. Once you finish your career/aspiration requirements, you can hoard your written books to submit them weekly to Literary Digests. You can now afford to get all the good, expensive objects for your home… and complete a milestone for upgrading them. At this point you can mostly ignore your motives. After maxing out your Writer career, it’s time to move on! Go to a public lot, bringing 7 of your friends along. Jam on a piano/guitar until you’ve made your §100 in Tips promotion requirement. You’ll have to spam the interaction. ♥ Complete Musical Genius 3 – The song I wrote on Piano didn’t count for some reason. ♥ Finish skilling your musical instruments. Switch to Painter Extraordinaire and start on Painting. 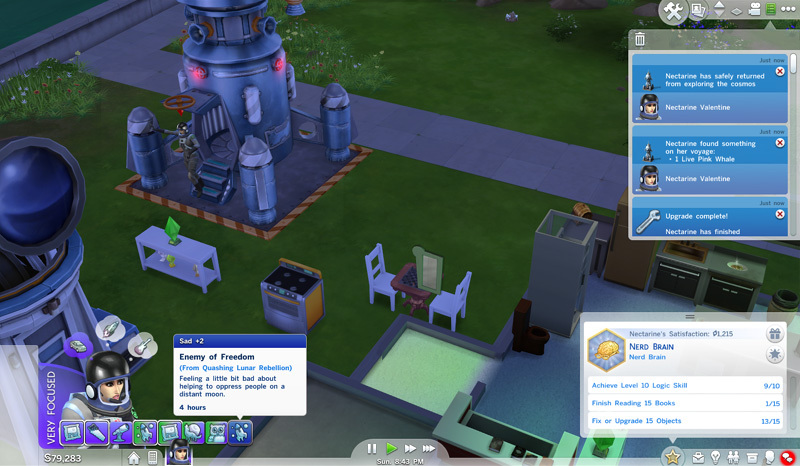 Sadly, the Perfectionist bonus, the Perfectly Made moodlet (Happy +3/4hrs) only activated at this point. Contributions from OrionTurtle via reddit. And the Queen of the Night was created, and Ialdabaoth saw that the worlds were separated by the abyss of night.